I don’t think I’ve ever been so happy to see a rider bail out early in my life. World Superbike rider Eugene Laverty had a high-speed crash at Imola’s turns 17-18 today after making contact with Alex Lowes’ bike. Laverty then jumped off his Aprilia while travelling approximately 160 mph, right before the bike hit a hard concrete wall and exploded. Out of the right-hand kink before Rivazza Alex came up the inside of me and took the line away. I tried to brake but he was running a little bit wide which is something you shouldn’t really be doing there. I had nowhere to go. It hooked my brake lines and pulled the brakes off so I had no brakes. I tried to pump them a few times but I had to get out of there. It isn’t pretty tumbling through the gravel trap there towards the wall so I was lucky to get away with it. The crash happened on lap 13 and forced the race to be red flagged early, per Crash.net. 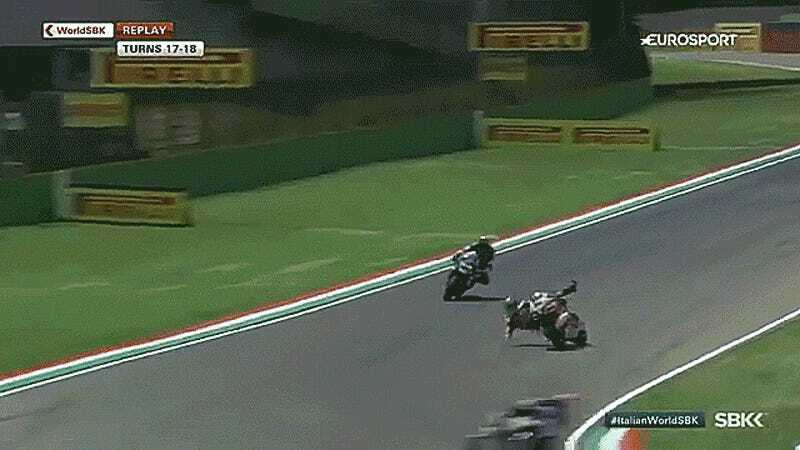 Neither rider was penalized for the incident. Lowes even went to check on Laverty immediately following the gnarly looking crash because it looked so bad. Fortunately, Laverty was quickly given an all-clear from the World Superbike medical center, and he expects to be able to race in Race Two tomorrow.